From Goodreads ~ In her late twenties, Cait Flanders found herself stuck in the consumerism cycle that grips so many of us: earn more, buy more, want more, rinse, repeat. Even after she worked her way out of nearly $30,000 of consumer debt, her old habits took hold again. When she realized that nothing she was doing or buying was making her happy - only keeping her from meeting her goals - she decided to set herself a challenge: she would not shop for an entire year. "The Year of Less" documents Cait’s life for twelve months during which she bought only consumables: groceries, toiletries, gas for her car. Along the way, she challenged herself to consume less of many other things besides shopping. She decluttered her apartment and got rid of 70 percent of her belongings; learned how to fix things rather than throw them away; researched the zero waste movement; and completed a television ban. At every stage, she learned that the less she consumed, the more fulfilled she felt. The challenge became a lifeline when, in the course of the year, Cait found herself in situations that turned her life upside down. In the face of hardship, she realized why she had always turned to shopping, alcohol, and food - and what it had cost her. Unable to reach for any of her usual vices, she changed habits she’d spent years perfecting and discovered what truly mattered to her. 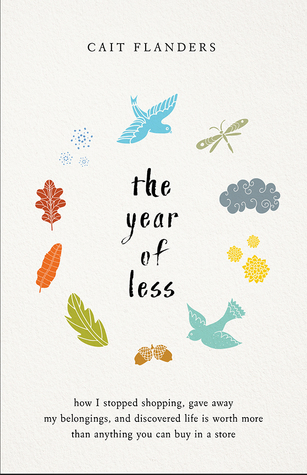 Blending Cait’s compelling story with inspiring insight and practical guidance, "The Year of Less" will leave you questioning what you’re holding on to in your own life - and, quite possibly, lead you to find your own path of less. I'm not a big shopper ... if I need something, I buy it. I rarely get tempted for impulse purchases. I learned a $1,500 lesson about 20 years ago when I impulsively bought a knitting machine and then hardly used it (I eventually tossed it after two moves and still not using it). The only things I buy when I don't need them are scented tarts/candles if I come across a sale ... but I use them on a daily basis. This book caught my eye, though, because I thought it would be interesting to see how a woman stopped shopping, gave away her stuff and lived a minimalist life. The author started by sorting through all her stuff and gave away everything she wasn't using, hadn't used in a while, didn't like, etc. Then she put herself on a shopping ban for a year ... she couldn't buy anything that wasn't a necessity (like food, toiletries, etc.). She could spend her money of travel but she had to do it as cost-efficient as possible. At the beginning of every chapter, she updated us on her progress. As it turns out, this book is less about not shopping and more of a memoir about her life. She is the oldest of three children and grew up in British Columbia. She realized she had a drinking problem so stopped. She had gained weight and lost 30 pounds. She describes her relationships, her friendships, her family, her career, etc. The not shopping part and living a more simple life seemed to be an aside ... so the title is very misleading. What I took from the book is she realized that how she dealt with stress was to eat, drink and shop and she took measures to find other ways (good for her!). All the stresses in her life are the focus of the book, though. In the appendix at the end of the book (after the epilogue), she lists ways that you can do with less, which is supposed to be what the book is about. I found it kind of strange that she still allows herself to buy books but then she gives them away when she's finished. Isn't that a waste of money? If she was going to practice what she is trying to preach, why doesn't she borrow books from her local library (like I do)? Yeah, I found this book inconsistent in parts too, and definitely not only about shopping less! I didn't really warm to it, actually.